I thought this time it was it. I have this merino wool jogger pants from Finisterre since Winter 2015. And following the precepts of Marie Kondo, I should thank it for its loyal service and retire it. I have been wearing it pretty much every relaxing weekends home from cold Winters to chilly summer nights. And it is now covered in so many lint balls that it’s bairly recognizable as you can see in the header image. What you see is a phenomenon known as pilling. Pilling is the formation of small balls of fibers on the surface of a fabric. It is mostly caused by friction, and it results in clothes looking worn out and unsightly. Pilling happens to the best of fabrics. Yes, even denim and cotton or whatever other fabric you like most. However, some fabrics are more likely to pill than others. In particular, cotton, polyester, acrylic and nylon are the most likely to pill. The least likely to pill is merino wool. The reason for this is that it’s a strong fabric, and once used to make a tightly-woven cloth, it’s almost impossible for it to pill. 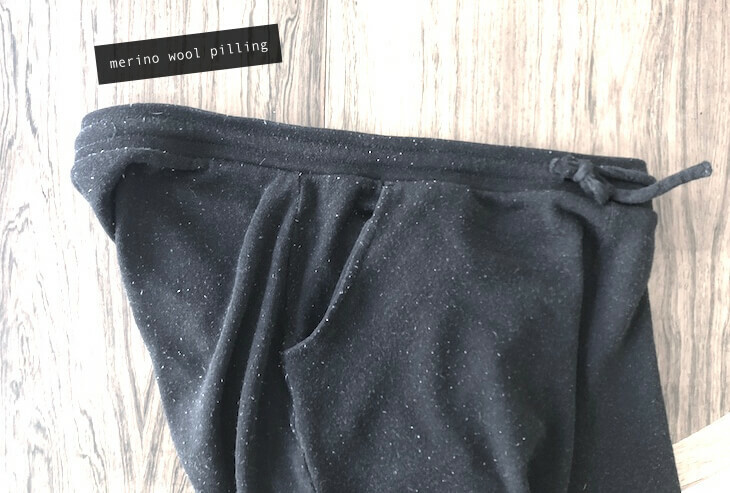 If you’ve been avoiding to wear your woolen sweater because of pilling, this article explains how you can remove lint balls and everything else you need to know about merino wool pilling. Why does Merino Wool Pill? Apparel made of merino wool, pills when groups of fibres break and get tangled together in small knots. These balls of fibres form because of the constant rubbing that occurs during washing or just normal wear. But the wearing out is not the only reason why merino wool pills. This problem also arises because of the technical aspects of fibres. For instance, the type of fiber used in making a garment matters. Clothes made of short wool fibres pill faster because they have more tiny ends as opposed to having one long and continuous fibre. Another factor that contributes to pilling is the type of merino wool yarn used. You see those warm and fuzzy jackets that you love wearing so much? Well, they are more likely to pill than other wool fabrics. Don’t get me wrong. I’m all for staying stylish and warm in your fleece jackets. But, it’s important to understand that such apparel is likely to pill faster than other clothes. The problem is that achieving that fleecy look of your jacket does not come cheap. The textile manufacturer has to use small wool fibres, which are left sticking out of the cloth. Overtime, these fibres start to tangle and form lint balls. The technique used in making merino wool yarn can also contribute to pilling. Essentially, there are two methods of creating wool yarn: the worsted and woollen systems. With the worsted method, merino wool fibres are first carded or rather separated. They are then combed and recombed several times until they’re running parallel to each other. During the combing process, any short or unbroken fibres are gotten rid of by the combing machine. The worsted technique leads to thin, tightly-twisted fibres, which are then used to make smooth, regular yarn. The woollen system is entirely different. It involves separating wool fibres and then mixing them freely so that they end up criss crossing each other. This means that the fibres are neither carded nor combed. The end result? A yarn made up of fibres in an entangled arrangement. As you might have guessed, worsted fabrics are less likely to pill than woollen ones. This is because their fibres are well-aligned and bound together so that there aren’t any sticking out. As usual, I am reconsidering the Marie Kondo goodbye protocole on my beloved Finisterre’s wool pants. Yes, I have them for years but beside the pilling, they are still in good shape, don’t show any wholes and have retained their shape. And maybe something can be done about the pilling. Removing lint balls from clothes is never fun. If you want to get over with this chore quickly,you should use an electric fabric shaver. You can find some pretty good deals on Amazon. One model that people really like is the Lalint Electric Lint Remover. It’s affordable, rechargeable, and it works like a charm! This tool is very similar to the fabric shaver. The only difference is that a sweater comb is operated manually. This doesn’t mean that it’s difficult to use. Just place your apparel on a flat surface, and run the sweater comb across it. If you’re on a budget or in an emergency situation, check if you have a hair roller at home. Although this technique will take much longer, it will suffice. To remove lints, place the garment on a flat surface, and then roll the Velcro hair roller along the surface of the fabric. As you do this, you will notice that the roller picks up any balls of fibres on your apparel. How Do You Avoid Merino Wool from Pilling? When your wool sweater pills, you now have several techniques you can use to remove them. But what’s even better is preventing these tiny balls of lint from forming in the first place. When you go shopping for wool apparel, you will find some described as worsted and others woolen. Always go for worsted fabrics as they are less likely to pill. As we described earlier, the fibres in these yarns are aligned and tightly-spun, which reduces their likelihood of tangling. Pilling typically comes from wearing, not washing. However, the way you wash it can affect the appearance of pilling if you are using a too harsh technique. As a general rule, it’s always better to hand wash your wool sweaters and other pill-prone garments. 1) Only use the wool cycle. If your washing machine does not have this setting, then use gentle or delicate washing cycle. 2) Turn the apparel inside out. This is important to prevent excessive abrasion. 3) Do not overload your washing machine. When you cram all your fuzzy jackets in the washer, you leave little room for movement, and this can encourage pilling. Some brands also recommend that you wash these fabrics on their own after 2-3 uses even if you wouldn’t really need to quite yet. Doing so reduces the chances of short fibers appearing on them. It also ensures that any lints on your fluffy clothes are not transferred to other garments. When washing clothes, a liquid detergent is preferred to washing powder. This is because granules from the powder cause abrasion, which in turn encourages pilling. If you have to use a washing powder, ensure it’s fully dissolved in water before adding in the clothes.